Five mixes recommended for the weekend. I have a constant buzz in my ear. Unless when I'm listing to music. Or when I'm focused. Or when I'm floating in the ocean with my head under water, looking up at the sky. This Dark Star mix combines all three, shifting its musical journey from focused beats to slowly expanding soundscapes and buzzing melodies, nuzzling up to your earbuds with a friendly kind of pressure. The opening words are by Joseph Brodsky, taken from the poem “A Song”. The Nobel-prize winning Brodsky was known for reciting his poems like incantations. His essay collection ‘Less Than One’ is definitely in my top ten books of all time. He viewed writing has ‘accelerated thinking’, which I really like. Don't worry about highbrow vertigo, though. Right after the poetry, we dive into a kid song about 'Beer isn't good for you'. Last season's soundtrack for Vetements was no less impressive. A completely different use of music, but worth every second of your time. After a whiff of classical music, you can hear the opening drums from ‘Silvester Anfang’ by Norwegian Deathmetal legends Mayhem. It’s from their debut EP ‘Deathcrush’ from 1987, which is considered to be one of the iconic cornerstones of the genre. Mayhem later became most notorious for being haunted by death and scandal. Their founder, ‘Euronymus’, who also probably started the death metal genre itself from his tiny record shop in Oslo and his self-funded label, which was fantastically named ‘Posercorpse', was murdered by sometime-band-member Vag Vikernes. The original Mayhem singer ‘Dead’, who is credited by some as inventing the signature ‘corpse face’ make-up, committed suicide in the house where the debut Mayhem album was being recorded. When Euronymus discovered the body, he stepped out to buy a disposable camera and used the pictures for a bootleg issue of the band’s album sleeve. Some people claim Euronymus made a necklace containing pieces of Dead’s shattered skull (he shot himself in the head) to be worn as a stage outfit. The band itself still survives to this day. ‘Sylvester Anyang’ is the opening track of every show. I’ve seen them twice, so far. When the drums die away, the frontman walks on stage dressed as a druid, holding an inverted cross and a hollowed-out human skull, which he swings about and uses for microphone effects. This is a picture of the last Mayhem gig I was at. 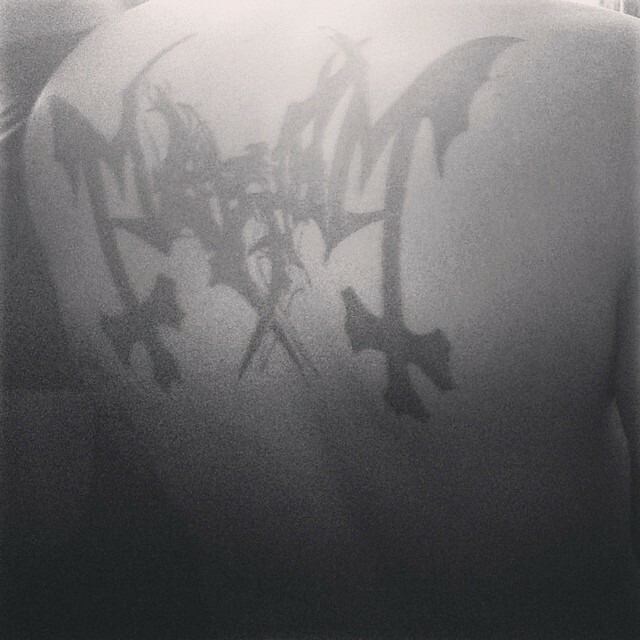 I took it in the pit, where the Mayhem core, as you can see, remains quite dedicated to their band. I posted it on Instagram that night and the band liked it a day later, which I thought was quite sweet and surreal, given the dark history behind the band’s origins. Anyway, this is a deep cut. Even for metal fans. You know we like Wiley. We also like Slimzee mumbling over dubplates and white labels like he's avoiding injuries from a gold-plated toothpick, precariously balanced between his lips. So the both of them together on an adrenaline-gland squeezing mix is a real treat. The beautiful sociopath females walking over Gareth Pugh's catwalk (at the Freemason's House) were soundtracked by a creeped-out mix of Grace Jones 'Corporate Cannibal'. Love everything about this. The way Val Garland was able to make stocking masks look so perfect is sheer magic.